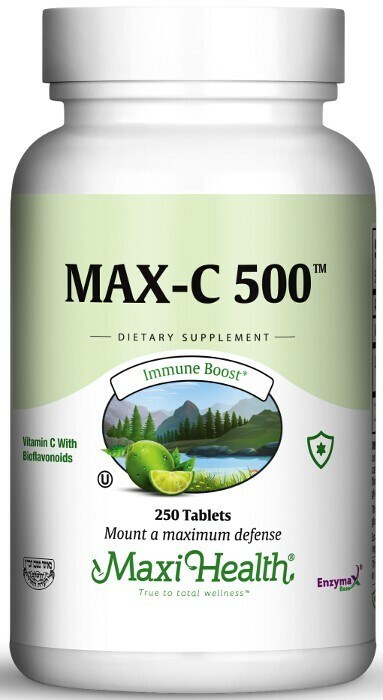 Max C 500™ is our vitamin C - bioflavonoid complex which works to support blood vessel, capillary, and vein strength. It also helps support a healthy immune system, connective tissue integrity, healthy function of the gums. Together these nutrients act as antioxidants to fight damage caused by free radicals . Other Ingredients: Other Ingredients: Dicalcium phosphate, stearic acid, microcrystalline cellulose, magnesium stearate, croscarmellose sodium, Enzymax (calcium carbonate, bromelain, papain, lipase, amylase, protease, silica), aqueous ﬁlm coating (puriﬁed water, hydroxypropyl methylcellulose, vegetable glycerin, titanium dioxide, chlorophyll). This product contains NO animal products, soy, wheat, sugar, salt, yeast, gluten, milk, artiﬁcial ﬂavors, colorings or preservatives. Enzymax, a vital digestive enzyme complex, is a registered trademark of Maxi Health ®, LLC.